Huh, a new release? For the Highland Cinema? I know how strange that must seem to you all, but I figured that once I got one o' them fancy big-screens and wired some classy speakers into my Nixon-era hi-fi, I owed it to myself to fire up an honest-to-goodness blockbuster and let my neighbors know that I mean business. Turns out, this particular box office stunner was super cool! 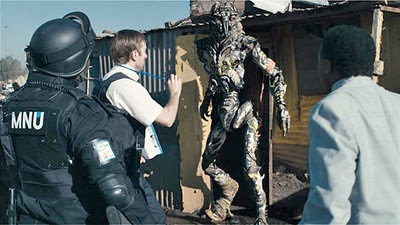 I'm not lying when I say I District 9 was really great, what with all its deep-space sea-creature aliens, non-stop nausea-cam, and frequent gloppy, sloppy, tinnitus-inducing explosions. But my favorite part, you ask? The obvious socio-political overtones! They somehow managed to avoid bein' preachy, overbearing, or condescending and I'm still trying to figure out how they pulled it off. Some feat.